This salad is so easy to make, it just requires tossing together some simply chopped fresh vegetables. 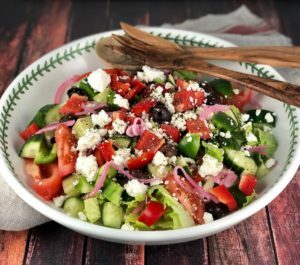 Use this recipe as an inspiration to develop your favorite Greek salad. Try tossing in some chick peas, pepperoncini or peppadew peppers. I’ve even tossed in prosciutto and toasted pita croutons. Pickled red onions were used in this version because they add a tasty punch of flavor. Sliced red onions could be substituted. Making vinaigrette is so easy. Combine all the ingredients in a glass jar and shake to mix well. 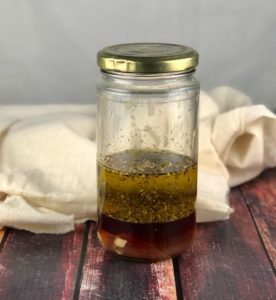 Mustard in vinaigrette acts an emulsifying agent and helps the vinegar and oil stay combined. I prefer Dijon mustard because of the mild flavor. A lot of vinaigrette recipes will call for 3 parts oil to 1 part vinegar. Since I like vinaigrette a little more tangy, I use 2 parts oil to 1 part vinegar. This colorful and refreshing salad is easy to make. Just requires tossing together some chopped fresh vegetables in a simple Greek vinaigrette dressing. Combine all the ingredients for the salad except the feta in a large bowl. Pour dressing over salad and toss to coat. Top with feta and gently mix into salad.